German automaker Volkswagen is in the grip of a worsening scandal. For the last six weeks, there's been a steady stream of revelations about how it rigged pollution tests on millions of its vehicles. Volkswagen says as many as 11 million cars may have been fitted with software to cheat diesel emissions tests. It will recall at least 8.5 million cars in Europe and another 500,000 in the U.S. The embattled company also admitted Tuesday it set carbon dioxide emissions and fuel consumption figures too low when certifying about 800,000 vehicles. Most have diesel engines, but some have gas (petrol) engines. The company has said it will cost at least 8.7 billion euros ($9.5 billion) to recall the diesel vehicles, and deal with the consequences of understating carbon dioxide emissions. Analysts say the total cost is likely to run into tens of billions of euros once fines, penalties and compensation are included. 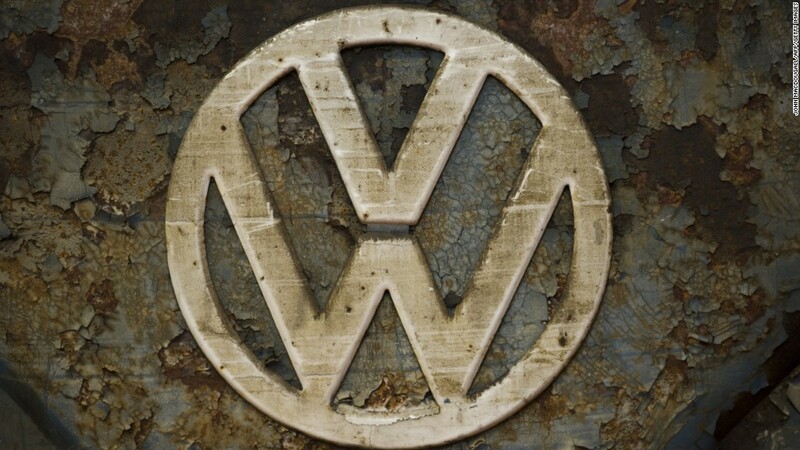 Volkswagen crashed to a loss of 1.7 billion euros ($1.9 billion) in the third quarter due to the scandal. That was down from a healthy profit of three billion euros in the same period last year, and its first quarterly loss in more than 15 years. It has promised to make massive savings, and has plenty of cash on hand for now: 28 billion euros at the end of September. That's the value that has been wiped off the company's market capitalization since the scandal first broke in September. The shares have plunged by nearly 30% since then, hurting investors such as Qatar, the German state of Lower Saxony and Volkswagen's (VLKAY) biggest shareholder, Porsche (POAHF). The cars in question cheated U.S. pollution tests by using software to make them seem greener. In real life, the cars would expel as much as 40 times the allowed levels of toxic nitrogen oxide.